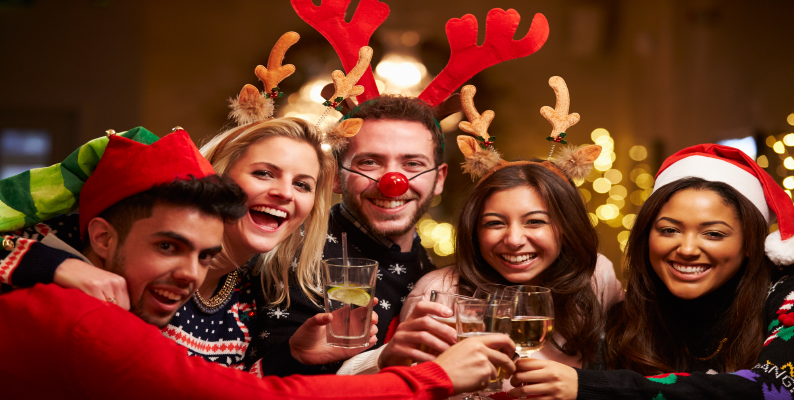 Thomas Tusser once said, “At Christmastime, play and make good cheer, for Christmas comes but once a year.” Take advantage of the annual countdown and fill each day this December with good cheer. 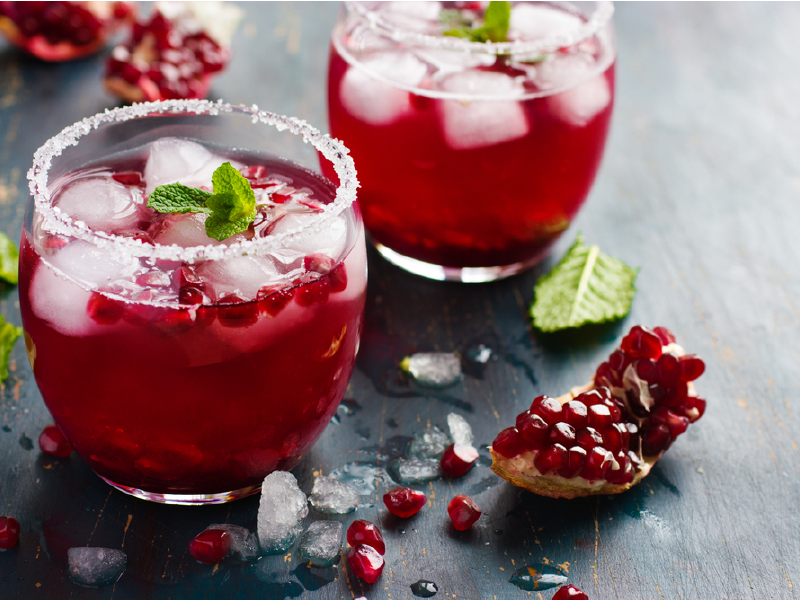 Here are 25 holiday cocktail recipes that will delight your taste-buds. Salted Caramel – Yes, Please! 2 Spring Cocktail Recipes You’ll Want To Try! In a cocktail shaker, combine the whiskey, amaretto and egg. Add cream if you like. Dry shake (without ice) vigorously. Fill the shaker with ice and shake again for 30 seconds. Strain into a chilled sour or cocktail glass. In a saucepan, add cranberry juice, ginger, cinnamon sticks and nutmeg. Simmer on medium heat for about 45 minutes. The juice will reduce a little bit but not become syrupy. Once cooled, strain with cheesecloth or a coffee filter in to a container. Add spiced cranberry juice and John AP Conoley Bourbon Whiskey to a cocktail shaker. Strain in to a glass with ice. Top with 3 oz. of ginger beer and give a quick stir. Grate fresh nutmeg on top of each cocktail. Recipe above makes approximately 2 cocktails depending on your size of glass. In a medium saucepan stir together the cocoa powder, sugar, and salt. Stir in the boiling water until the sugar has dissolved and the cocoa isn’t lumpy. Turn the burner to medium heat. Stir in the milk. Let the milk heat up, stirring occasionally. Watch it carefully so it doesn’t scorch!! Remember you aren’t cooking the milk. Just warming it. When the hot chocolate has reached your desired drinking temperature, remove it from the heat and stir in the vanilla, half and half, and bourbon. 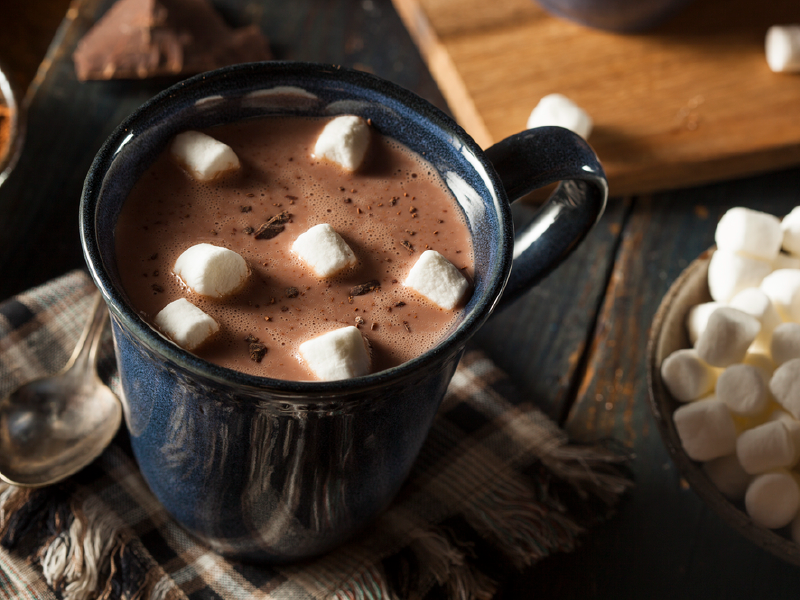 Divide the hot chocolate between 4 mugs, top each with marshmallows, and serve immediately. In a small dish, pour caramel sauce. In another small dish, pour cinnamon sugar. Dip champagne flutes into caramel to rim glass, then dip in cinnamon sugar. Pour apple cider, caramel Vitzellen Vodka, and top with champagne into flutes. Garnish with an apple slice and serve. In a cocktail glass stir together Vitzellen Vodka, pomegranate juice, pomegranate seeds, tbsp. lime juice, honey, and ice. Top off with ginger beer and garnish with a sprig of fresh rosemary. Stir and serve in a rocks glass over ice. Place the cucumber, gin, lemon juice & mint into a blender and whizz until smooth. Add the sugar if needed to taste, and whizz again. Serve immediately in martini glasses and garnish with the lemon or cucumber slices and a spring of mint. Top up with a little sparkling or tonic water if desired. Enjoy! Put cocktail glasses in the freezer to chill. About 10 mins or so should be fine. Gather the rest of your ingredients. Combine cocktail ingredients in mixing glass or large pitcher (depending on your quantities), stir, and refrigerate- the colder the better. Pour cupcake flavored Magic Shell® into a squeeze bottle, leaving enough room at the top to be able to shake it to mix thoroughly. Add red food coloring bit by bit (capping the bottle and shaking well after each addition) until desired color is reached. Remove a glass from the freezer and paint a design on the inside surface with your bottle of Magic Shell®- stars and swirls work well. Place glass in back in freezer, or in refrigerator until serving time. Repeat with the rest of the glasses. Immediately before serving, remove a glass from fridge or freezer, fill with the chilled cocktail mixture, and enjoy! In a cocktail shaker, add the bourbon, mint, lemon and ginger. Firmly muddle until pieces break down (less than a minute). Add ice and shake vigorously for 30 seconds, then strain into coupe glasses. Top with ginger beer, and garnish with a couple cranberries. Before you begin, make sure your shot glass mold has been washed with soapy water, and is clean and entirely dry. Place the mold on a baking sheet, and preheat the oven to 350 F.
Break the crooks into smaller pieces and fill the center of each mold with bits of candy cane pieces, coming up to the top of the straight pieces. You will have extra candy cane scraps left over that you can save for another use. Bake the candy cane cups in the preheated oven for 12-14 minutes, until the candy has melted together in the cups. You might start to see just a few small bubbles along the edges. Watch it carefully, because you don’t want the candy to turn bubbly and brown. Remove the pan from the oven and immediately use a knife or metal spatula to scrape off any candy that has melted outside of the cups. Use a metal spoon or the bottom of a flat cup to gently press on the candy, to remove any air bubbles and make a completely flat bottom. Let the cups cool completely before proceeding. Once cool, turn the cups inside out and gently pull and twist the candy cane cup out of the mold. Fill the cups vodka. Pour the light corn syrup on to a small shallow dish. Pour the crushed candy canes onto another small shallow dish. Dip two martini glasses first in the corn syrup, then in the crushed candy canes. Fill a cocktail shaker halfway with ice. Add the vodka, white chocolate liqueur, and peppermint schnapps. Shake vigorously for 30 seconds. Add the half-and-half to the cocktail shaker, and swirl to combine. 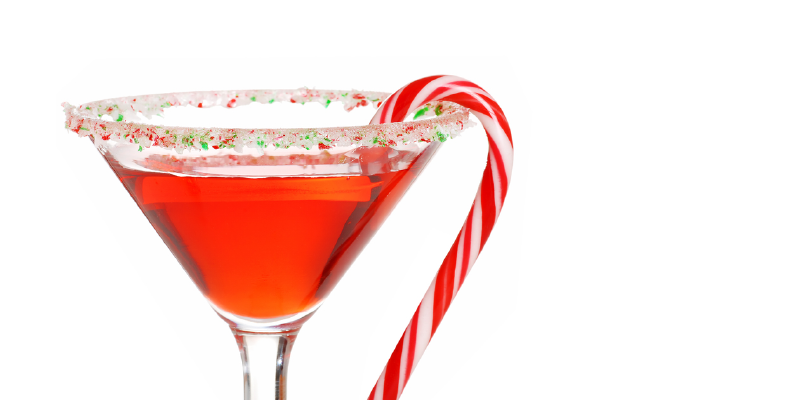 Divide the cocktail between the two martini glasses, garnish with a mini candy cane and serve. Shake the ingredients with ice in a cocktail shaker. Place chunks of chocolate into a heat-safe bowl. Place this bowl over a pot of water. Heat and simmer the water until the chocolate is completely melted. Pour the melted chocolate onto a plate and dip the rim of the cocktail glass into the chocolate. Allow the chocolate to set. .75 ounce of maple syrup. Shake ingredients and serve over a rocks glass over ice. Rim a cocktail glass with white chocolate and sugar. Pour the liqueurs, vanilla and vodka into a cocktail shaker filled with ice. Strain into the prepared glass. 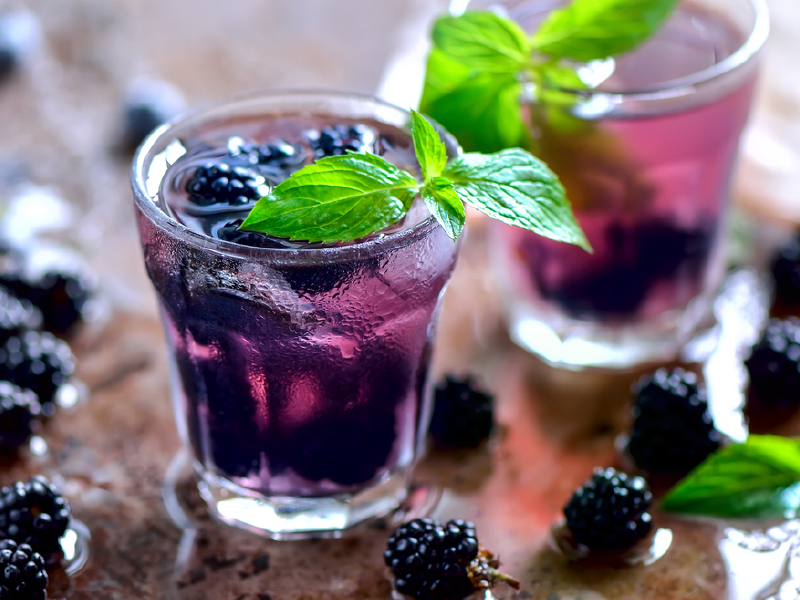 Put the blackberries, mint and sugar in the bottom of a glass. Muddle with the back of a wooden spoon or a muddler. Add the lime juice, vodka and ice. Put in a cocktail shaker and shake or stir well. Garnish with mint and lime. Slowly pour each ingredient 1 at a time into a 1 1/2 to 2 oz shooter. If done in the order listed, it should come out layered. If you want to see the layers use brown crème de cacao or any chocolate liquor. Add 1-2 shots of whiskey and cinnamon to taste. When paired together: It’s nice, full of SPICE, and definitely WARMS YOUR SOUL!!! 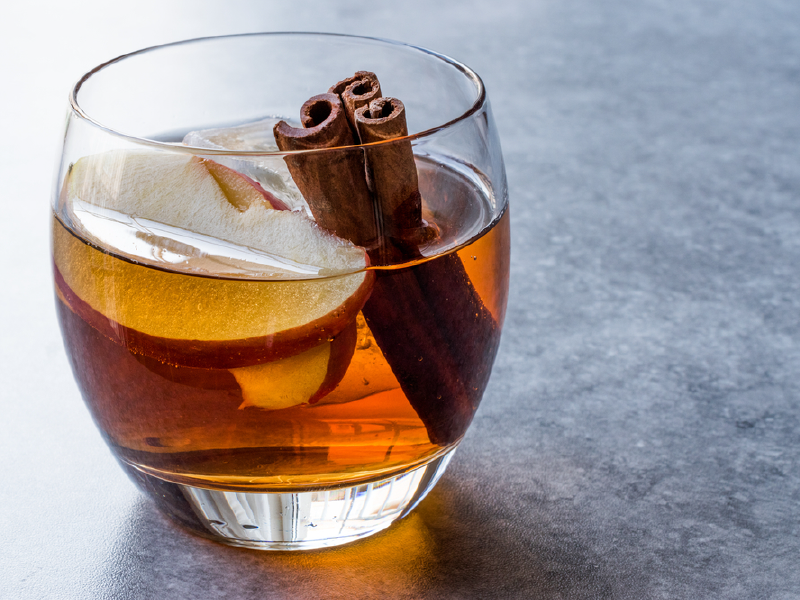 When using regular cider, you may want to add an additional shot of whiskey for the spice! Stir lime juice, mint tea, hibiscus syrup, and chocolate bitters into a cocktail shaker. Stir in 1⁄4 cup black cherry soda. 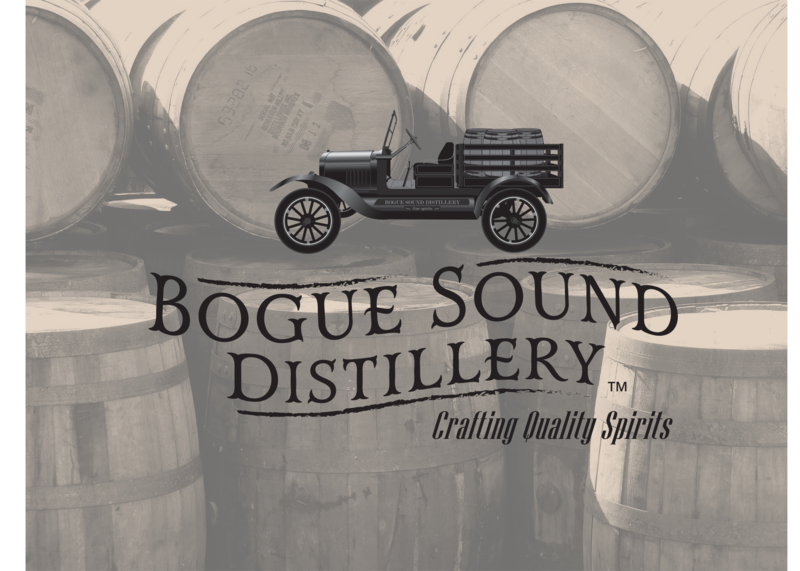 Strain into a chilled glass and top with more black cherry soda and 2 dashes of bitters. Garnish with hibiscus flower and lime. 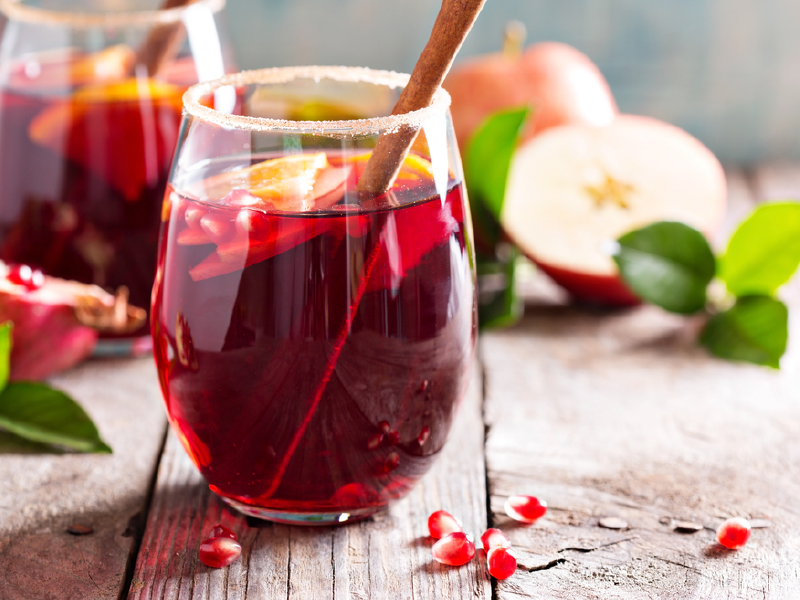 Put wine, brandy, orange juice, cherry juice, chopped fruit and spices to a pitcher and stir. Chill for at least 2 hours or even overnight. Just before serving, mix in frozen berries and Sprite. Strain if desired (to remove spices), and serve in individual glasses filled with fruit. 1 tablespoon crushed candy cane or peppermint candy. 1/2-ounce B&B (Benedictine and Brandy). Place crushed candy cane bits into pint glass. Muddle the candy cane slightly, breaking up the bigger pieces. Do not over-muddle into a powder. Add vodka, brandy and half-and-half and stir. Pour into a shaker with ice. Shake lightly to chill and strain into old-fashioned glass full of ice. Add a peppermint stick and stir. Thoroughly wash mint leaves and place in a decanter or jar. Add Vitzellen Vodka into container and muddle slightly to release the essential oils. Store in a cool, dark place for at least 3 days – longer if you want a stronger taste. Rim a cocktail glass with red and white candy sprinkles by tracing a line of honey around the top edge of the glass, then dipping the glass directly into the plate of sprinkles. In a cocktail shaker, combine the remaining ingredients. Strain and pour into prepared cocktail glass. Cut the lime in half. Squeeze the juice from one half into a serving jug. Chop the other half of the lime into thin rounds and place into the jug with the cranberries and the ice. 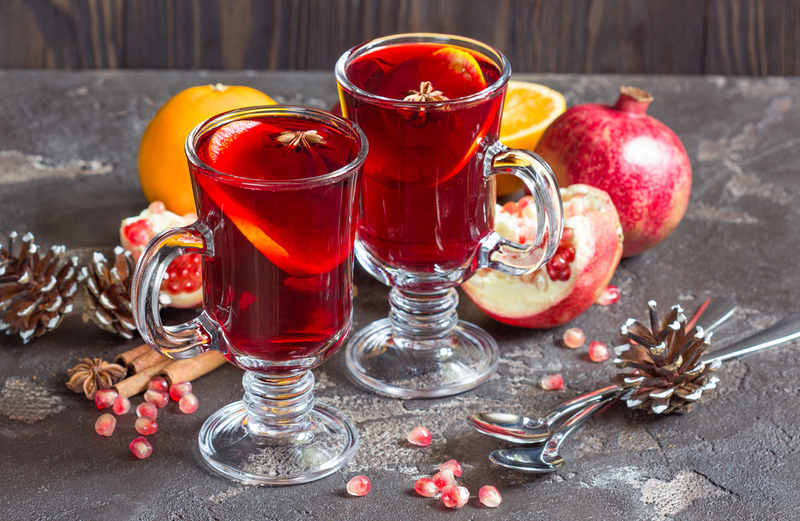 Pour over the cava or sparkling wine, cranberry juice, vodka and triple sec and stir. Serve immediately whilst cold and store the jug, covered with tin foil, in the fridge until all the cocktail has been drunk. In a cocktail shaker, add ice, Vitzellen Vodka, Irish Cream, Gingerbread Syrup, Vanilla Extract, and Cream. Shake vigorously. Strain into a chilled cocktail glass. Garnish with grated nutmeg on top. 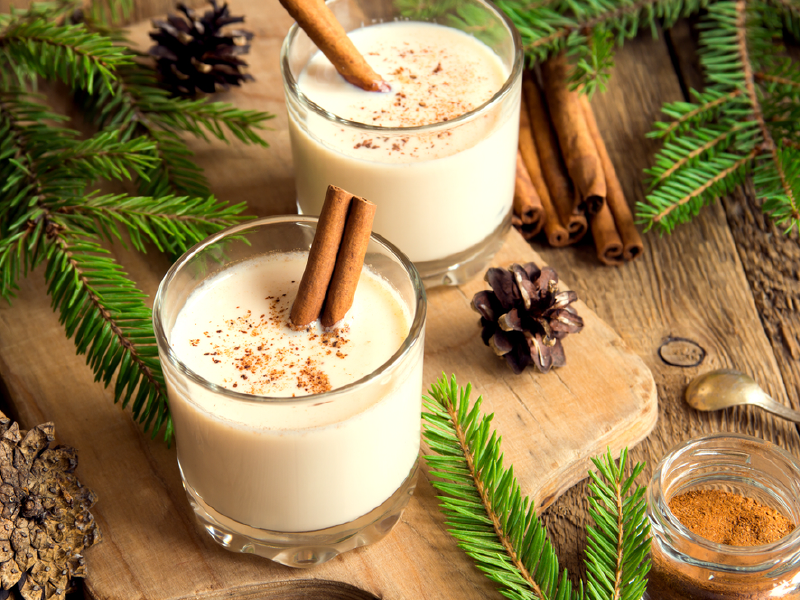 On Christmas day as we sit around and exchange gifts while smelling the fragrances of the kitchen, the eggnog cocktail is a classic recipe that everyone loves. Shake the eggnog, amaretto and vodka in a cocktail shaker filled with ice. Strain into a low-ball glass and garnish with cinnamon or nutmeg on top.